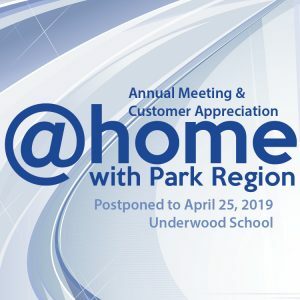 Our Annual Meeting and Customer Appreciation event scheduled for Thursday, April 11, 2019 has been postponed to Thursday, April 25th, 2019 due to the potential for inclement weather. Our schedule will remain the same with registration and supper from 5:00-6:30pm, kid’s area from 6:00-7:30pm, & Annual Meeting starting at 6:30pm. We hope to see you on April 25th at the Underwood School.